During the spring break, we new media management students had a chance to get in touch with some of the Newhouse alumni to hear about their career paths and stories. The new media management seminar is included in our program. Each student in our major is paired with a speaker to write about their stories in the whitepaper we are going to finish after the spring break. 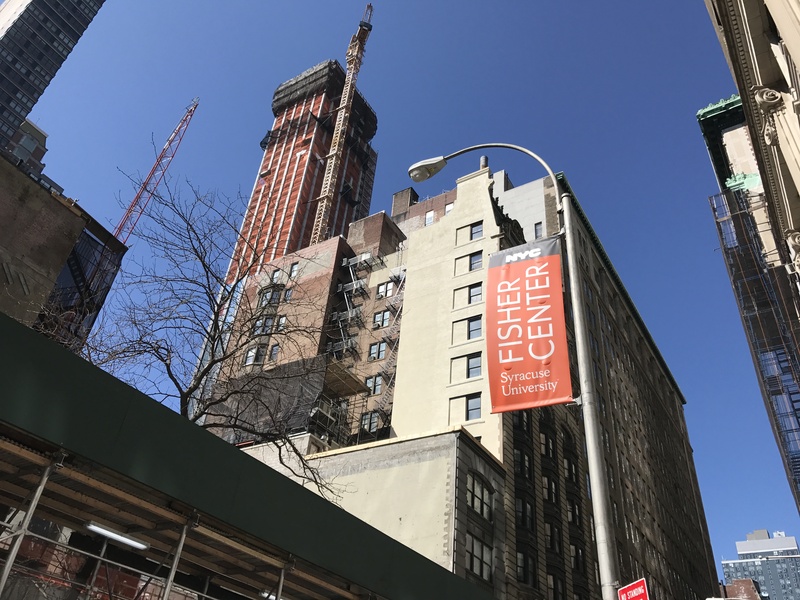 The seminar is held at Syracuse University Fisher Center in New York City. It was a very advanced study center with big, clean classroom and welcoming staff. There was even breakfast provided in the classroom in the morning so we didn’t need to rush to a coffee shop before class began. The seminar lasted four days with a total of eighteen speakers. We had the honor of meeting Andy Meyer, the current president of Newhouse’s alumni networking and mentorship group known as Newhouse 44. The background of the speakers is versatile. They could from the university, a news website, marketing company, research company, online video company and so on. The speaker I was responsible for was an entertainment editor from Business Insider. He gave us an impressive conversation with professor Masiclat at the end of day one. As a content creator, he talked about his thoughts on SEO and content; the SEO is good and useful but knowing what people would love to read and the reason behind that is definitely more important. He also introduced how traffic, content and search are working together today. I had a personal interview with him afterwards and he gave me many pieces of great career advice in a professional perspective. The speaker that gave me the deepest impression was Suya Wang. She is the founder of westOeast. It is a marketing company that helps western clients promote their product to the Chinese market because sometimes the Chinese culture makes it hard to understand for westerners. For example, since the year 2018 represents the “year of the dog” on the Chinese lunar calendar, Dior prints the Chinese character “dog” on the red packet (it is a traditional in Chinese New Year that people will give children lucky money in a red packet for the best luck in the year). The marketing department of Dior might think it is a good marketing strategy for Chinese consumers during the holiday season. However, the fact is that “dog” is also a humiliating word in China when it refers to people so the red packet with a “dog” character on it is quite weird for most of the Chinese people when they first see it (although we know they didn’t intend to mean that way, it is still quite uncomfortable). To avoid the awkward moment as it is mentioned above, Suya’s company will provide a solution that is more acceptable for the Chinese consumer and will help the company penetrate the market. I really could feel that Suya is trying her best to bridge the west and east world together, just as the name of her company. Another speaker who works in a university marketing department also left me with a deep impression. She is a nice and funny lady to talk with. She introduced another powerful analytic online tool for traffic analysis, Google Data Studio, different from Google Analytics which we learned from class. She gave a detailed description of what we could do if we choose to be a data analyst in future. Although not going to travel around seems to be a tiny pity during the spring break, I really feel the NYC seminar was valuable. Moreover, it was great to be in New York where so many cultures merge together. My classmates and I are currently working on the completion of the class whitepaper including the speaker conversations in the seminar. I think it could be a great help for our careers in the future.